I am currently building a chicken tractor for my girls. 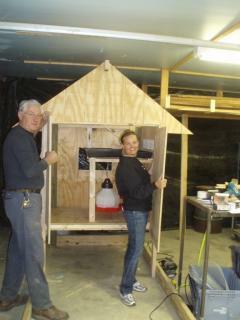 Building the coop with Bob (my father-in-law). I cannot wait for the arrival of my chicks - 27/28 of April. since about 3rd grade i have wanted chickens. my dad would not let me, but one of our employees was going to 'get into the chicken business' - small scale. so, in about 5th grade i started helping him here and there. his chix did not last long...so that was that. so we got back to indiana and i asked him 3 times if i could get chickens and i think he wanted me to quit asking so he said (and i quote) "honey, whatever you want to do". so i took that as a go-ahead. i ordered my chicks that day. he was surprised that i ordered them and they were coming in april. so - since then i have been obsessed with getting the coop built and the brooder ready. i am just raising them for their eggs (not meat). the kids will love them!!! and so will their friends and cousins. dallas and calvin (my nephews - stone too if he were in IN and not CA) will get to pick out a chick and name her. 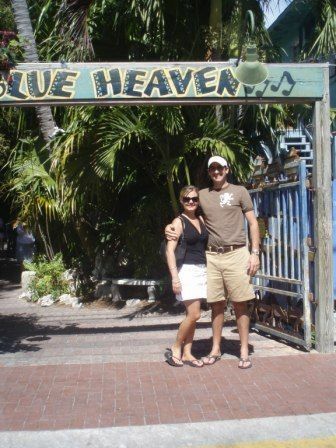 the name of the coop will be blue heaven (for a bar that is down in key west and there were chickens all over the place) and one of the 'girls' - hens will be named FRANNY FEATHERS - after my grandmother frances...granny franny! so - that sums it up. i think aaron wishes i would concetrate more on building our house right now, but we are at a great point that i can get the chick thing done and then back to working on our house...which is moving along quite nicely. i told him i would rather figure the chicken thing out here first and then move them to our new home. this way we can create a special area for them. all brown eggers except easter egger = blue or green and campine is white. for those people that do not want brown eggs.